"No, really, guys, it's totally gonna happen this time," panda Mei Xiang is (metaphorically*) telling the people of D.C.
Mei's hormones are on the rise, zoo vets report, which means she'll "either give birth to a cub or experience the end of a pseudopregnancy in 40 to 50 days." But the odds are good it's a baby, right? "Mei Xiang has had five consecutive pseudopregnancies since 2007," the zoo says. The backstory: The zoo's female giant panda returned to a more normal cycle this year after three years of going into heat early. Mei Xiang was artificially inseminated twice in April with sperm from Tian Tian that was harvested and frozen in 2005. Zoo staff live-tweeted the second insemination, making pretty much all of Washington feel dirty for some undefinable reason. Since then, scientists been checking Mei's hormone levels each week, and have been performing frequent ultrasounds -- even though panda fetuses don't start developing until the last weeks of pregnancy, and they're difficult to detend via ultrasound. The panda pair's only cub, Tai Shan, was basically a(n adorable, butterstick-sized) surprise. Even so, let's all get our hopes up for the first week of October. 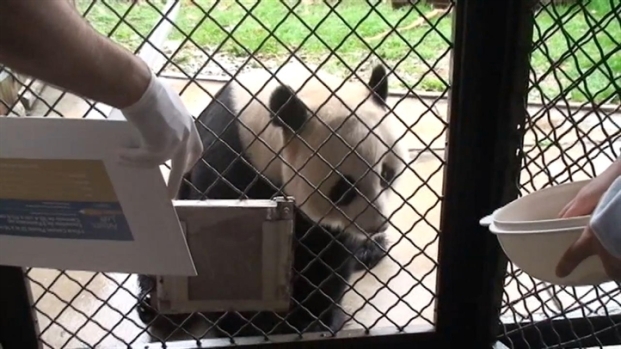 Tian Tian is a painting pro, but Mei Xiang is pretty much just in it for the snacks.